The Most Attractive Eye Color Is…? A recent poll conducted by AllAboutVision.com of more than 66,000 responses indicated that the most attractive eye color is…….green. In second place was light blue, and third place was hazel. Those of us (thanks mom and dad) with green eyes are relatively rare, with a worldwide prevalence of somewhere between 2-15%. So how does one get green eyes? The colored part of the eye is called the iris, and nearly all eye color is determined by how much brown pigment is in the iris. Regardless of our eye color, we all have varying amounts of brown pigment in our eye. A person with less brown pigment will have lighter eyes, and of course, more pigment results in brown eyes. But there is more to it than that. It is important to note that there is no green or blue coloring in our iris. A scientific phenomenon called Rayleigh scattering causes light to be reflected, depending on the anatomy of the iris itself as well as the amount of brown pigment in the iris. This phenomenon is what makes eyes appear different shades of green, blue, or brown. In addition, our eyes can appear to change shades of colors depending on lighting (both artificial and sunlight), makeup, or the colors around us, such as our clothing. I bet you did not know…. Everyone has a unique smell, except for twins, who smell the same. Humans are the only species known to cry emotional tears. There are tiny mites that live in the follicles of your eyelashes. By age 60, most people will have lost about half of their taste buds. I was out one night over the summer getting eaten alive by mosquitoes while taking photos of the Veterans’ Square Monument in Lower Makefield. 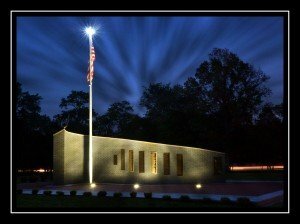 I was just notified recently that it was one of the photos chosen for the Veterans’ Memorial fundraising cards that will be sold with all the proceeds going to Monument upkeep, etc. in Yardley and Lower Makefield. What a great picture, congratulations on being chosen. Where and how can I buy them? I also liked all the informative tidbits, thank you. Oh yeah, Julia- I paid the price that night! Love the dark sky. The photo is beautiful and shows you could have a second successul career.